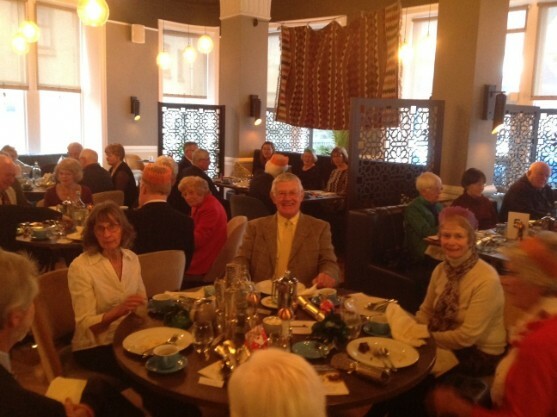 The Club held its annual Ladies Christmas Lunch on Tuesday, 18th December which involved wives and partners of members coming together for friendship on what would be otherwise an "ordinary" Rotary weekly lunch. The Ladies Christmas Lunch also includes, as guests, the widows of former Rotarians along with invitations to members of Inner Wheel. A good attendance was in evidence and with a table plan in place a cross section of attendees very much enjoyed each other's company. 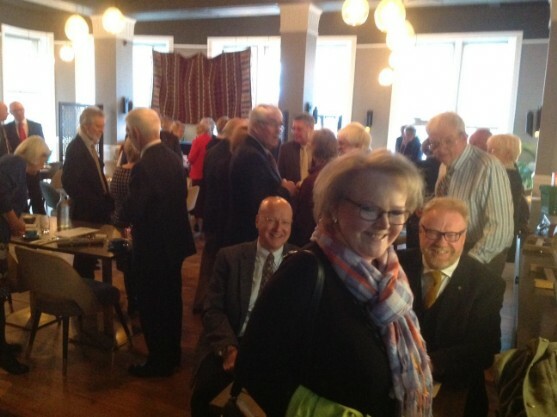 The meal and service at the Perle Hotel was generally agreed to be excellent and President Iain Mac Intyre commented specially on this and indeed the conviviality that was evident in the room during the lunch. After meal mints were donated by Rotarian Walter Burton with the Christmas favours coming from PP Graham Fraser/Alba. President Iain reflected on the good works both Rotary and Inner Wheel do in our local area and indeed, where appropriate, overseas and all concerned should feel proud of this. Our photos show welcoming hosts, Ronnie Forbes and Ronnie Neil, with the latter's wife Shona trying to get her coat hung up, and the second picture shows Michael Urwin and companions looking very satisfied after their meal.